CHICAGO (WLS) -- Tucker Speckman wasn't trying to hide that he was playing hooky at Wrigley Field Tuesday afternoon. 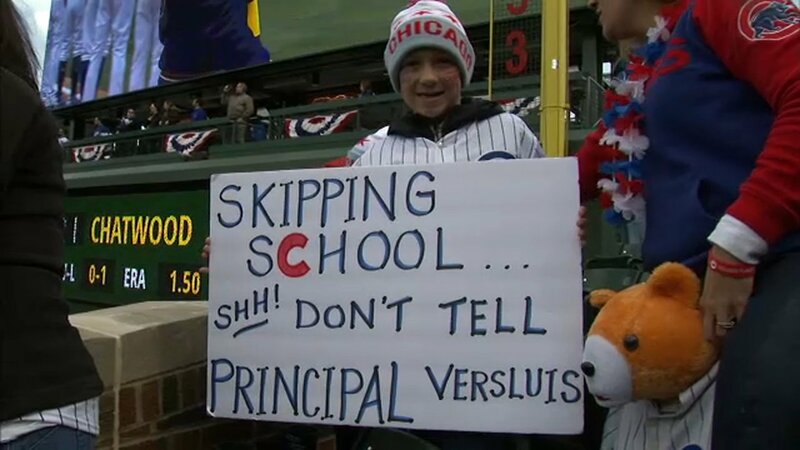 He came to his first home opener with a sign that read: "Skipping School. Shh! Don't tell Principal Versluis." Speckman was hoping his sign would be captured on television. "We made the sign because we thought it would be funny because we wanted our principal to see we were at the game," said Speckman. But the Wells Elementary School student didn't expect Major League Baseball to throw him a curve ball. The league tweeted out a photo of him with the caption "We got you" to its 8.3 million followers. "I was excited because it was kind of weird because all we did was make a sign," he said. His school principal didn't see the tweet, but he did spot Speckman at the ball park. Principal Patrick Versluis was attending the game with family. "I kind of hollered, 'Hey, you're skipping school' kind of thing and they popped that sign up and it was just complete humor at that point and time," said Versluis. Speckman said he thought it was funny. "I wasn't nervous because I know he's such a great principal he wouldn't be mad or anything," he said. They even posed for a picture with Speckman still holding his sign. Versluis said he got permission from his boss to take the day off. "I want to make sure that the message isn't about skipping school. I don't want to condone that. Obviously we did and we made that choice as a family, but I also believe in those experiences," he said.